Sleek and versatile, the Metallic Series Window Box Planter is the perfect addition to any window, deck or patio. 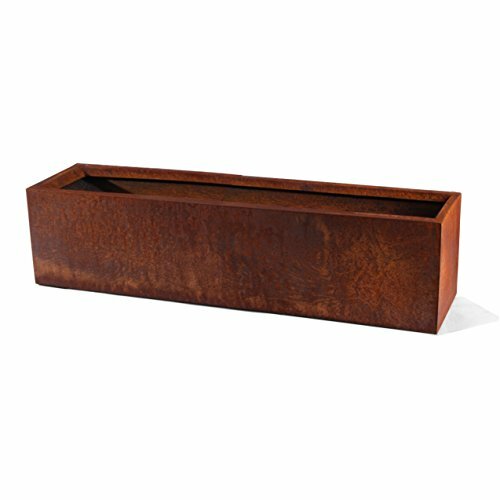 Featuring a rusted patina finish and a modern trough design, the Window Box planter looks sharp hanging below a window using the supplied brackets or even lined along a walkway. Crafted from thick gauge, fully seam welded Corten Steel, all Veradek Metallic Series planters are proven to resist weather related issues such as cracking in both winter and summer months. The planter's Corten Steel construction ensures that the structure will only exhibit surface rust for aesthetic purposes and never rust through over time. Given this added durability, Metallic Series planters are ideal in both residential and commercial settings. In addition, all Metallic Series planters are equipped with styrofoam insulation to help ensure that plants stay healthy in both hot and cold extremes. With a Veradek product you can rest assured that you are receiving the perfect balance of design, durability and convenience. It is important to note that all Corten Steel planters are shipped in their raw steel state, gradually developing a rich rust patina finish over time.